Just like it sounds, hot water runs through the tubes of a hot water coil to heat the air. As the cool entering air passes over the hot fin surface created by the hot water running through the tubes the air is then heated. These coils are usually constructed using 1 or 2 rows of tubes but can be built with more depending on the application. Just the opposite happens during the heat exchange of a chilled water coil. As cold water passes through the tubes cooling the fin surface; the warm entering air is then cooled as it passes over the fin surface of the coil. These coils are also often used to remove moister or dehumidify the air passing through. Chilled water coils usually require more rows of tubes to meet the performance desired, anywhere from 2- 12. 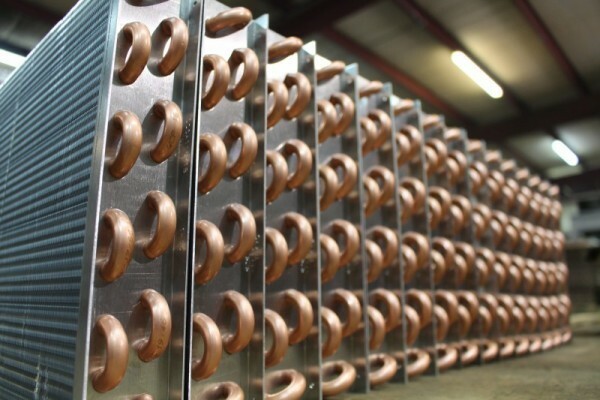 We offer a wide variety of sizing options for both hot and chill water coils to make sure your coil is able to meet the exact performance criteria you are looking for. Specialty Coils also offers standard water coils with lot pricing available. Call or email today for Standard Water Coil Pricing or for a free quote on a custom hot or chill water coil. Please fill out our FREE Quote Form to the right or call 866-320-9050. Sign up for our newsletter and we will send you special offers and incentives.